Mysteries abound in life. Some of us enjoy mysteries, others fear them. We all have different gifts and talents and areas of life where we understand things that are a mystery to others. What do we do when we can fathom a mystery that others have trouble grasping? Do we use this as an opportunity to exalt ourselves above others, to attempt to control or take advantage of them through their fears? Or do we share with others and shed light on the mystery, guiding them to a place of understanding as well? What are some mysteries that you comprehend that you can share with others? 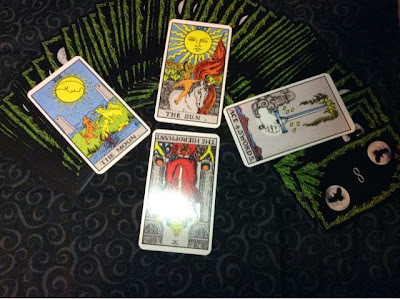 In the area of tarot and related services, religion, and other spiritual fields, there is often an artificial air of mystery that seems to be used to attract "followers" and to get business. People are hungry for answers, and some people are more than ready to profit off of that, even if perhaps they don't have answers to give. Can you see areas where people have wrongly taken advantage of the idea of mysteries? Thankfully, there are many practitioners who sincerely want to help others. If you ever seek services from others or investigate any group that claims to have the answers, be sure to take the time to try to see the difference. Are there any examples you can think of where people have handled mysteries with kindness and respect? "The clouds which the imagination of commentators have gathered around it, will be dissipated, if we look for, in it, not mysteries of ineffable wisdom, but an attempt at a reasonable doctrine, made when reason arose, an effort to grasp the plan of the universe, and to secure the link which binds to one common principle, all the elements which are around us." In other words, a great air of mystery surrounds this text when in fact, it's intended to be a straight-forward writing of reasoning and attempting to understand the universe from the perspective of some who lived a couple thousand years ago. So it should be with us. When there is a mystery that we comprehend, we should share that mystery with others in an attempt to help them understand for themselves. We should shine the light on mystery so it becomes knowledge and understanding, so that everyone can benefit. And the good news is this: life has enough mystery in it where if we all shared the mysteries that we think we understand, we still won't run out anytime soon of mystery or others who need the mystery explained the best we can. Do you have any thoughts on mysteries that you'd like to share?